This acoustically treated room’s design is ideal for monitoring and achieving an accurate mix. The room is large enough for 4 people plus the engineer to sit comfortably during sessions. Pictured is the Pro Tools recording control console and studio monitors. Synthesizers and bass guitars can be recorded in this room as their signals are patched directly into Pro Tools without the need for microphones. The climate-controlled Live Room can accommodate a 4-piece band, but it is most commonly used for recording instruments one at a time and during overdubs to achieve maximum separation of instruments and flexibility during editing and mixing. 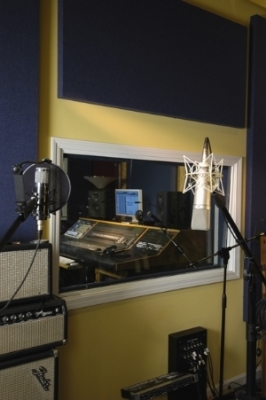 Microphone recording is primarily done in the Live Room. The acoustic treatments in this room ensure tracks that are not smeared or reverberant, which allows the effective use of sound-shaping effects like custom reverbs during mixing. 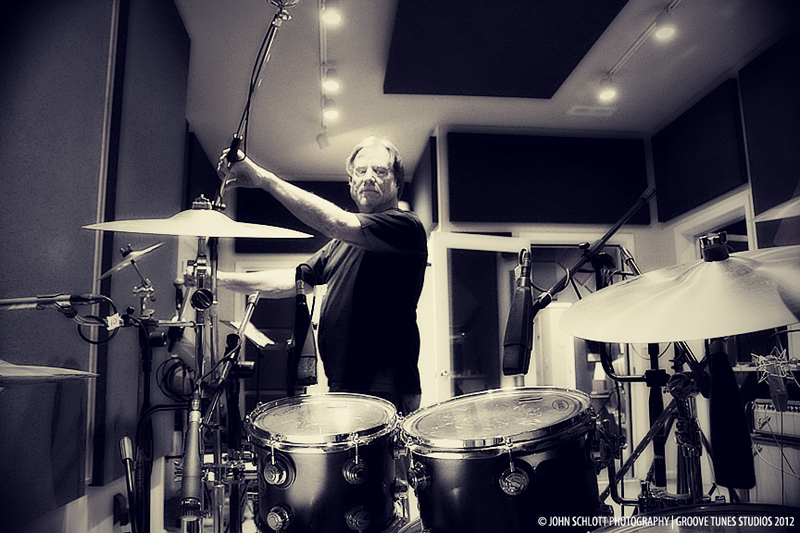 The drum kit is recorded using ten to twelve microphones, each mic selected for its own specific purpose. All signals are fed to the Control Room using Monster Cable and Mogami cables patched through a common double wall. Musicians have a line of sight into the Control Room. Vocalists’ performances are typically overdubbed and recorded in the Live Room. This climate-controlled room offers superb acoustics in a non-claustrophobic environment for maximum comfort and performance results. Vocalists remain in communication with the engineer through their headphones and they have a line of sight into the control room. Top quality microphones are used to capture the performance. Various time-alignment and pitch-correction programs are an integral part of this Pro Tools system, so there is no need to worry about singing every last note perfectly on every take. Numerous vocal takes can be combined into one perfect track. Dozens of reverb, delay, compression, and other interesting sound-processing programs can be used to properly enhance the vocal and to make the performance fit in with the rest of the music. This room, adjacent to the Live Room, is the perfect spot to take a break during long sessions. It is large, open, and comfortable, and it features a 108" high definition projection television and audiophile quality surround sound. Seating is arranged in theater fashion where all seats face the front screen. The seats in the rear are elevated above the floor level for improved viewing. This room was designed to “golden ratio” dimensions to reduce standing waves, thus making it an ideal listening room. Audiophile grade equipment is used throughout. This room is also sometimes used for tracking certain instruments. The screened in outdoor patio provides comfort and tranquility on this semi-wooded lot, located at the entrance to the studio. Often times deer and other woods creatures are spotted within a few feet of the patio. The patio is the Smoking Section. Smokers are invited to light up, tilt back in their recliners, and dream up their next acts of creation. This is also a great spot to take a breather from the session and enjoy a meal or some snacks. Groove Tunes has received rave reviews for its room acoustics. You will be hard-pressed to find another studio that sounds so good! To minimize sound transmission, all outer and inner walls and ceilings have double layers of sheet rock screwed onto resilient “sound” channels, attached to 2x6 studs, with fiberglass insulation packed inside. All rooms have 10’ or 12’ high ceilings and are climate controlled using Fiberduct acoustically silent vent ducting system. Rooms are built to “golden ratio” room dimensions to minimize standing waves. Extensive use of full-round and half-round ASC tube traps and corner traps are used. 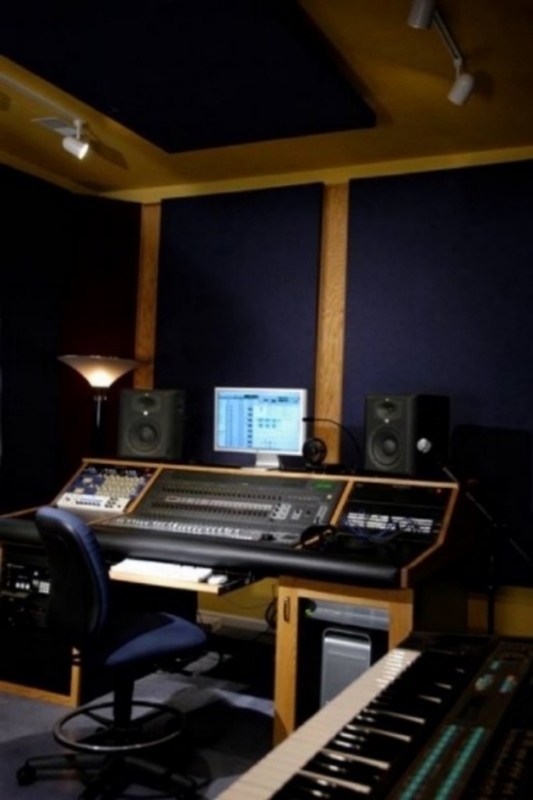 Extensive use of Acoustical Fabric Solutions custom-made wall panels, 1”, 2” and 4” thick are used in the lounge, live room, and control room. Auralex, Kinetics, and Acoustical Fabric Solutions custom designed corner traps are used in the lounge, live room and control room to tame low frequency standing waves. Acoustical Fabric Solutions custom 2” thick fiberglass "floating" ceiling clouds are used in the live room and control room. Plush carpeting is used throughout to minimize floor echoes and noise from foot traffic. A kitchenette, equipped with refrigerator, microwave oven, coffee pot, and various snacks and drinks is available for client use. Clean restroom facilities are provided, with access from the main entry hallway.